First of all, y'all ... I am touched by your the emails regarding the move. "Can I help you pack?" and "All good wishes" were bountiful. Thank you. Must admit to teariness as I packed up linens for my daughter's twin bed. This one-time "big girl bed" will now go to another little girl growing up. 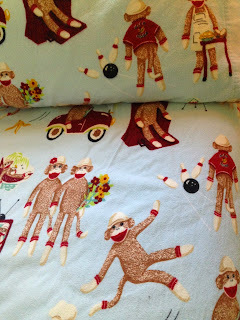 Folding the flannel monkey sheets especially flooded me with memories of making the bed ... day after day making the bed. Some sheets are hard to part with, but there's no way I can stretch them to fit a full or queen. Give it up. Move on. Shed the things. New beginnings await. Don't tell anyone but I'm hanging on to the pool towel that my son once said always reminds him of summer days at Pound Ridge town pool. As I go through the stuff, I guess what I'm trying to say is that today is the time of our lives.